A Senior Marketing Professional holds responsibility for creating, communicating and delivering offerings that have value for customers, clients or business partners, in a multitude of contexts. Growing from managing a function or product, marketing professionals take on additional responsibility for planning and strategy related to each product. This involves product features, geography and customer segment, interacting frequently with Sales, Finance, Service and other functions within the company. This is to ensure end-to-end customer satisfaction and guarantee the customer not only buys the same product/service repeatedly but also brings new customers through reference, word of mouth and brand championing. With the enhanced role of digital and technology solutions, Senior Marketing Professionals face challenges in tapping to a plethora of audiences, markets and communications models. Data analysis, research and innovation all form part of the modern marketer’s array of weapons to rethink consumer needs and patterns of behaviour. A CMO is closely aligned with all aspects of the company’s operations and needs to understand how the various functions can be best leveraged for a achieving company sales and business targets. For any company, CMO’s play a strategic and visionary role in not only managing marketing campaigns, but also influencing the strategies for product development, supply chain management, commodity pricing, and customer services. Only the CMOs, who can sweep away all obstacles in an ever-changing business environment, will be able to build their companies into outstanding marketing enterprises with core competence. Understanding these challenges, we at IIM Kozhikode have designed a programme which will give you an edge by progressing through marketing language, logic, strategy, and implementation. This will give you the essential tools to successfully lead the marketing function as your career progresses. 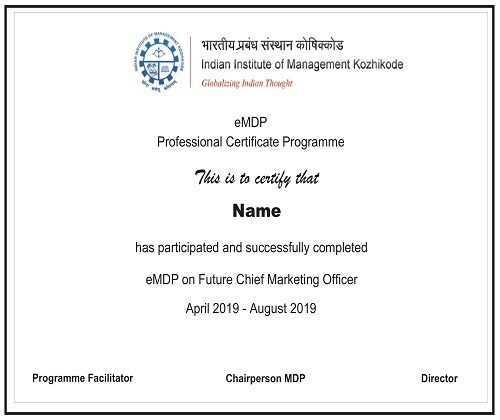 After completion of the program, the participant will earn an IIM Kozhikode certificate in Future Chief Marketing Officer program. Prof. Praveen Sugathan holds a PGDM from IIM Kozhikode and has completed FPM from IIM Bangalore. 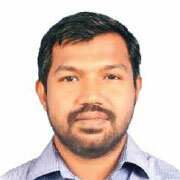 He specialises in the firm-customer interfaces, which are facilitated by new technologies and media. • Selected as one of the best accepted papers at 2015 Academy of Management Meeting during August 7-11 in Vancouver, BC, Canada. Anandakuttan Unnithan is a PhD and an MBA from Cochin University and has completed his B-Tech from Government Engineering College Thrissur. His research areas include response categories in Likert scales and measurement invariance, body esteem, appearance anxiety and consumption motives. 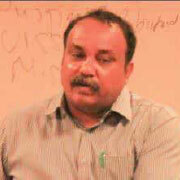 He was also a Chairperson of Management Development Programmes and Post Graduate Programmes at IIM Kozhikode. The programme uses a series of case studies, contextualised examples, and hands-on exercises to aid participants in understanding the key marketing imperatives. It will be delivered through live virtual interactive classes on your device. Assignments and Projects: The programme require participants to work on individual and group assignments and projects to help the participants apply their conceptual learning in the programme to actual organisational decision scenarios. Evaluation will be done via online exams, case analysis, assignments and classroom participation. A minimum of 75% attendance is a prerequisite for the successful completion of the programme. Certification: Participants who successfully complete the exams, projects, assignments and satisfy the requisite attendance criteria, will be awarded a certificate of completion.